Tagine is a dish typical of Maghreb cuisine. A dish with a thousand versions, tagine is prepared with ingredients and spices that differ from one region to another. Everyone can adapt it as they please. But don’t worry that it will be complicated and take a long time to prepare; it’s a simple dish that anyone can make. The recipe is perfect for using all the leftover vegetables you have at home. I love these simmered dishes that take a little bit of everything. Traditionally, tagine is eaten directly from the dish—which sits in the center of the table—with a piece of bread. 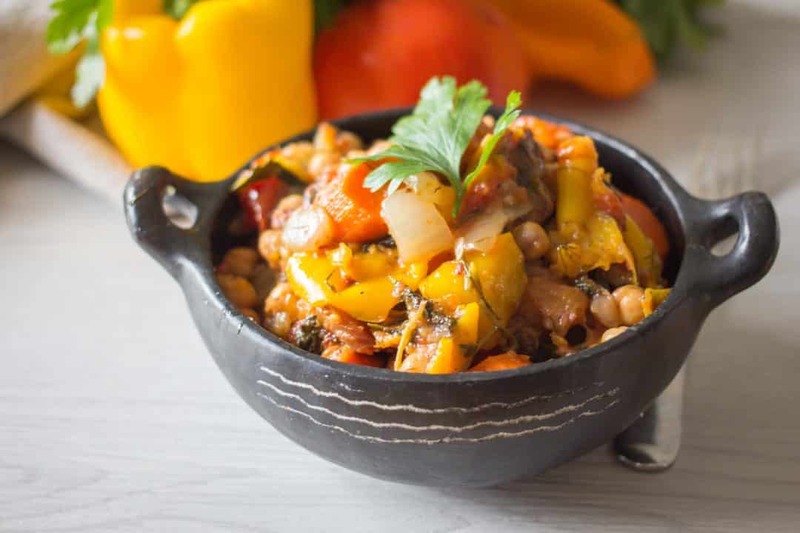 You will love the fragrant juice and tender vegetables of this tagine. • Heat the oil in a pot. Peel the garlic and onion, slice, and pour into the pot. • Add the spices (paprika, coriander, and turmeric), salt, and pepper. Mix. Brown for a few minutes until the onion is tender. If necessary, add water. • Peel and wash the carrots, pepper, and potatoes. Cut all the vegetables into cubes. • Pour the carrots, potatoes, pepper, tomato, and spinach leaves into the pot and mix with the spices. • Add water and bring to boil under covered lid. The water should cover the vegetables. • When the water boils, remove the lid and lower the heat. Simmer for 20 minutes. • Add the chickpeas (already cooked), stir, and continue cooking for 15 minutes. • Serve with a little fresh parsley on a bed of semolina.